The old joke that kids often tell goes like this, “What time is it when an elephant sits on your fence?” And the punchline of course is, “time to get a new fence.” The joke may be corny and not at all funny, but there is little doubt that a bit of truth rings true. Especially when it comes to thinking about the fence that you may have in your yard. How do you know when to repair or replace a fence? Is it even repairable at all? If any of these questions are plaguing you this summer, take a quick read below as we walk through some simple steps to help you decide whether you need to repair or replace your fence. Let’s take a look at some common issues that fence owners often face. Many popular privacy fence styles are made of wood and there are many reasons why you may be facing this problem. Maybe you just moved into a new home and it’s obvious that the previous owner did not maintain the fence properly. 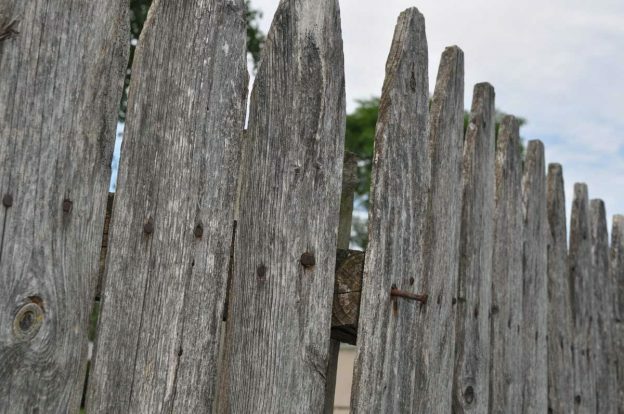 Perhaps you are the old homeowner and you are realizing that you’ve neglected your fence for way to long, and now it is literally rotting around you. This can be a challenging problem to address, and when considering whether you should repair it or replace, the answer comes down to simple economics. You cannot simply paint over rotting wood and have it magically be restored. All you will have done is seal in the rot and it will continue its destructive work. All of the rotten wood will need to be replaced. The question to consider is this: does the savings in time and material required to replace the rotten portions of the fence outweigh the cost and crisp appearance of simply replacing the entire thing. You can use a fence calculator or get professional estimates to help you determine what the cost of replacement might be. When calculating your options, don’t forget to take into account any time or expense that will be required to remove the existing fence. While peeling paint can be an indicator of rotten wood (see the paragraph above), it certainly doesn’t have to be. If you are satisfied that the wood underneath is solid, then a fresh coat of paint could certainly be just what your tired looking fence needs to give it new life. 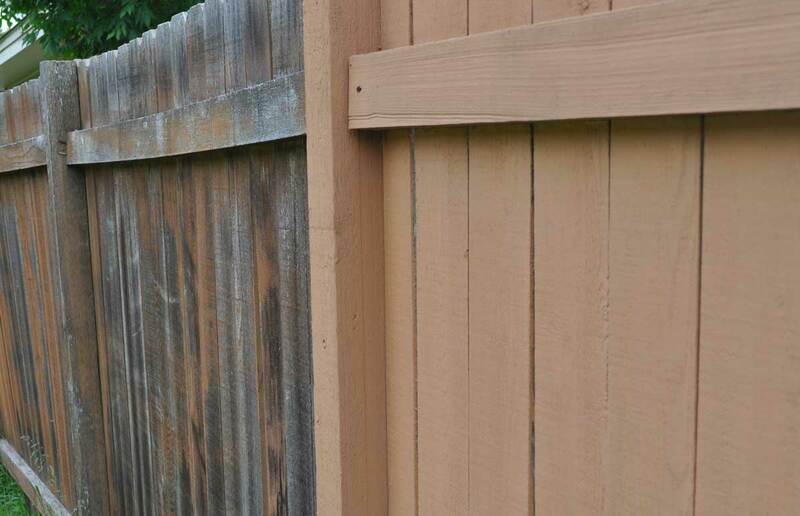 There a few important steps to keep in mind as you get your fence ready for paint. Ensure that all of the loose paint is off. There are several ways to do this. The easiest is with a pressure washer. Make sure you test a small area first to ensure that you aren’t using too much pressure. Too much pressure or the wrong nozzle can scar the wood, and it will show up even after you have re-painted. If you don’t have access to a pressure washer, a hand scraper and a good stiff wire brush will achieve the same results, albeit with a bit more time and physical effort. Ensure that the fence is clean. Splashes of mud can dry and begin to flake off underneath your fresh paint. Not taking the time to clean the fence properly before you begin will result in frustration, as your new paint job could begin peeling off shortly after you finish. Of course, if you aren’t up for painting, or if you want to eliminate the need to paint for years to come, you may want to consider this opportunity to upgrade your fence to a new vinyl fence. Once installed, these are virtually maintenance free and our vinyl fence calculator makes it easy to estimate this option. Squeaky hinges, latches that don’t catch and gates that don’t line up properly are just a few problems that you may see as your fence begins to age. If the fence panels and posts themselves are still in good condition, then this may be an instance where you choose to make a few simple upgrades to improve the function of what you already have. When asking yourself how much a new fence costs vs. how much new hardware costs consider that all of your fence hardware, from hinges to latches, is fairly easy to replace, and is readily available for purchase. Ultimately, the decision to repair or replace your fence can only be decided by you. Carefully weigh the expenses with your desired outcome and you will quickly find the best path forward for you and your home. Next Step – If you decide on replacement then the next step will be estimating materials for the project. Use our wood fence calculator or our vinyl fence calculator to estimate the materials for your installation project.